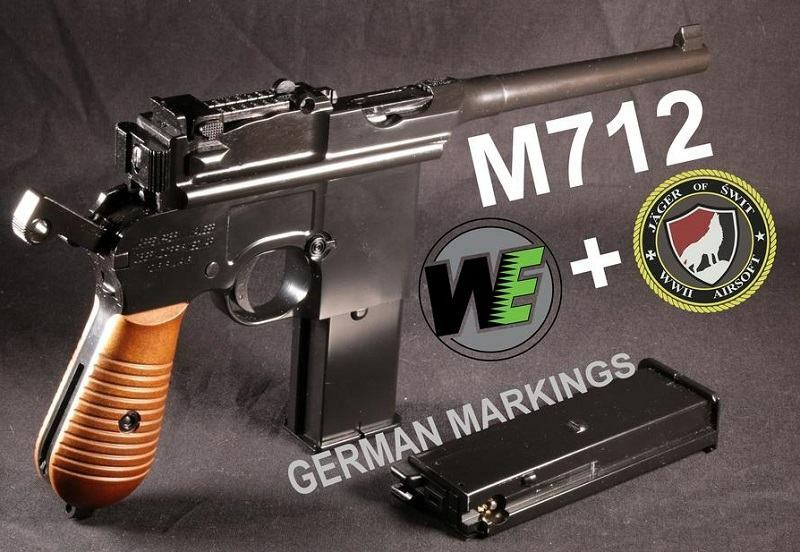 Review of the M712 GBB, manufactured by WE and modified by SWIT AIRSOFT. This version has a very realistic appearence thanks to real MAUSER markings done with CNC tools. The M712 manufactured by WE is an excellent replica. Internals are reliable, inner barrel and hop-up rubber are MARUI standard allowing upgrade and disassembly is easy. This version from SWIT AIRSOFT has the best externals compared to others M712 like HFC, MARUSHIN, TERCEL or KWC. In fact contrary to stock replicas that have no marking or chinese markings, here, there are german realistic markings from MAUSER on it and it’s wonderful. They are deeply engraved by CNC tools and well realized. You’ll find in the box an ABS stock that allows you to transform it in a GBB carbine or simply use it as a holster. Performances are fine, fast firing, full-auto mode, good accuracy and range, simply use heavy bb’s as the hop-up rubber is a bit strong. The replica is delivered with a long 27 bb’s magazine but you can buy spare short 11 bb’s magazines from WE or ARMORER WORKS that are completely compatible. This replica will suit all airsoft players, easy to use and maintenance, particularly WW2/WW1 players or for post-apocalyptic games. And some HD photos HERE!